With 155 delegates, Texas has by far the highest number of delegates up for grabs among the states holding primaries on Super Tuesday, March 1, 2016. A candidate must win a minimum of 1,237 delegates to win the Republican presidential nomination. Texas alone could provide more than 10% of the delegates needed to become the Republican Party’s nominee. So who is leading in Texas? 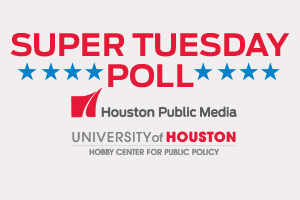 The Houston Public Media and the University of Houston Hobby Schoo of Public Affairs Super Tuesday Poll examined who is leading among the Republican candidates and what Texas voters think about pressing public policy concerns.